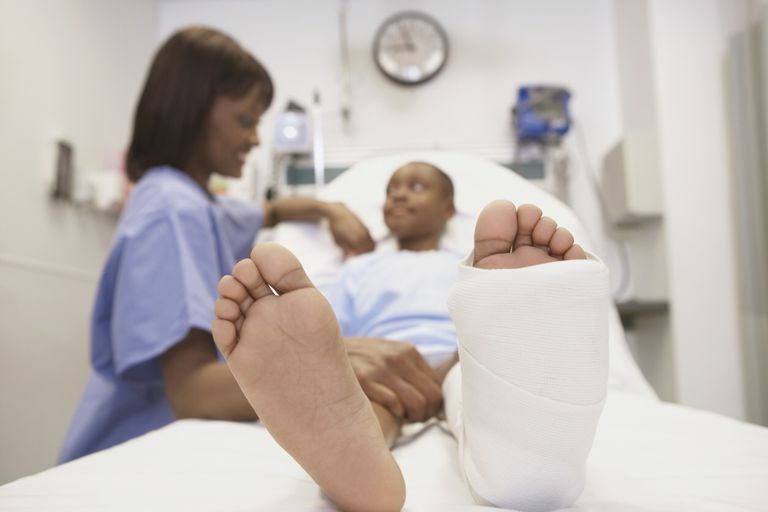 Fracture reduction is the term used to describe how a bone is fixed or set after a fracture. The pieces of bone must be put in close proximity to one another so that healing can occur. Fracture reduction is essential to ensure that the bone heals properly and that permanent functional loss or deformity is avoided. If you suffer trauma and suspect that you may have broken a bone, you must seek medical attention immediately. Failure to do so can cause permanent nerve, vascular, or bone damage and may result in significant functional loss. A closed reduction involves using the hands to maneuver the fractured bone pieces into their correct positions. Occasionally specialized instruments are used to provide a light-traction force to help separate the fractured bone pieces so that they can be easily adjusted. More severe fractures may require an open reduction. This is a surgical procedure called an open reduction internal fixation (ORIF). An incision is made in the skin and the broken bone is visualized. Then the bone pieces are brought together and fixed together with metal pieces and screws. The metal instruments are meant to be left in place permanently, but occasionally the metal must be removed if it causes irritation of the surrounding soft tissue. Another way to reduce and stabilize a fracture is by the use of percutaneous pins. These are pins that are passed through the skin and into the bone pieces to hold them in place. The pins are left in place until adequate healing has taken place, and then they are removed by your doctor. Occasionally a metal frame called an external fixator is used to hold the pins and bones in place. If you have suffered a fracture, your physical therapist should be familiar with the type of reduction that was used to set your fracture. Typically fractures require a period of immobilization during healing. This is done with a cast or a brace. Common problems after a period of immobilization include loss of range of motion and strength, impaired balance and body awareness, and pain or swelling. Your physical therapist can help you manage these problems to help ensure a safe return to normal function. An ORIF is a surgical procedure, and after the surgery scar tissue will be present over the incision site. Your physical therapist can help teach you stretches and scar tissue massage to help manage the scar tissue. If percutaneous pins were used to reduce your fracture, scar tissue may also be present where the pins pierced the skin. Wolff's law states that your bone grows and heals in response to the stress that is placed upon it. When appropriate healing has taken place, your physical therapist can help decide which exercises would be best to help ensure that maximal bone healing occurs and that you are able to function normally after a fracture. Your PT may prescribe a home exercise program to help you regain strength and mobility. Specific exercises can help you improve your mobility while placing just the right amount of stress through your bone to aid in the healing process. If you break a bone, seek medical attention immediately. Ask your doctor questions and understand the type of reduction that is necessary to fix the fracture. Once healing has taken place, physical therapy may be necessary to help ensure that you safely and quickly return to optimal function. Also Known As: Fracture setting.